Indianapolis. St. Louis. Griffin. Flynn. Washington. Seattle. Smith. San Francisco. Denver. Tebow. And now, Madden. The dominoes that fell in Peyton Manning's release, free agency, and his signing on Tuesday with the Broncos tumbled all the way to the cover of the NFL's signature video game. In addition to displacing Tim Tebow, the Bronco fan favorite who was one of the league's biggest stories in 2011, Manning altered the tournament EA Sports concocted to determine its next cover star, right up to the last day. Nowhere is it more visible than in Tebow's "seeding" in this Madden March bracket. He is 14th out of 16 contenders in his "region." "If we were doing the seedings, sitting in that room three weeks ago going over the candidates, Tebow might have been No. 1, or a 2 or a 3 at the worst," said Anthony Stevenson, EA Sports' top man in Madden's marketing operation. "He had a great year, he led his team to the playoffs when they were expected to be in the basement, and he had that huge playoff win against the Steelers." Despite a tough first-round pairing, Tim Tebow could still advance, if his motivated fans get out the vote. It's the fact Tebow may not even be a starter next year that caused him to slip from prohibitive favorite to cannon fodder against a prototypical Madden cover candidate: Houston running back Arian Foster. Tebow's final seeding was a last-minute call late Tuesday, making EA Sports' seeding team every bit the NCAA tournament committee it sought to emulate. "You see every once in a while in the NCAA tournament, a team have a really good year and then one of their best players gets injured right before the bracket's announced," Stevenson said. "I think Kenyon Martin broke his leg with Cincinnati several years ago. So what does the committe do then? Do you seed based on the past performance, or what the future games would look like without him. With Tebow, this is just the way we decided to do it." Stevenson added that if anyone can outperform his seeding, it's Tebow, who is nationally visible and has a fan base that is as motivated to vote for him, regardless of his playing situation, as others may be to vote against him because of his overexposure. And now he has the benefit of the association with the Jets and their large fan base. "I know his fans are passionate," Stevenson said. "His seeding will not be why he didn't advance, if he doesn't advance." This is the second year Madden has held a fan-voted tournament to determine its cover star. The field of 32 announced today was drawn from a two-week qualifying-round of 64, in which fans picked one of two players for each NFL team. From there, EA Sports' seeding decisions were based as much on the player's perceived strength in a national popularity contest as who an appropriate opponent for him would be, and not just in the first round. Stevenson agreed that future matchups were in mind as the bracket was put together. For example: Lloyd and teammate Rob Gronkowski facing each other mean the Patriots are guaranteed a second-round berth. There, either could face Dallas' DeMarcus Ware, if he gets by Minnesota's Jared Allen. The Patriots and the Cowboys are possibly the two most polarizing teams in the nation, with motivated fan bases locally, and large numbers of fans who despise even the sound of their names nationally. Yet these fans may be forced to choose between one of the two, sending the winner to Madden's final four. • Carolina Panthers quarterback Cam Newton, seeded first in his half of the bracket, got the most votes overall. "No surprise," said Anthony Stevenson of EA Sports. "He had a great season as a rookie, was a great fantasy player, and is coming off of a national championship year at Auburn, which has a huge fan base, too." • Though not a rookie, Victor Cruz had a sensational debut last year for the New York Giants and is a two-seed. Stevenson said Cruz goes there because of his out-of-nowhere personal story, the New York Giants' large market and fan base, and the fact the Giants won the Super Bowl. Vegas likes Cruz, too, calling him a 12-1 shot to win it all, fourth-best when the contest opened. • Stevenson thinks Seattle's Marshawn Lynch, an 8 seed, could take down his region's No. 1, the Green Bay Packers quarterback Aaron Rodgers. Lynch has the benefit of being known for a big play (the "Beast Mode" playoff touchdown against the Saints in 2011) and the fact superstitious Packer fans voted their man out of the tournament last year. "For every vote I saw for Rodgers, I think I saw two pages of comments from Packer fans saying 'Don't vote for him, we don't want the [Madden Cover Curse]. • Calvin Johnson is a six-seed, which I disagree with considerably. "OK, let me turn this around and ask who is it seeded above him that you would replace?" Stevenson asked me. I said either Drew Brees at No. 4 or Ray Rice at No. 5. "Really?" Stevenson said, sounding incredulous. "It goes back to the polarizing idea, like Tebow or [Philadelphia quarterback Michael] Vick," Stevenson said. "Half love him and half have a sour taste in their mouth from seeing him so much. Is it the same with these 'America's Teams.'? Do the fans of the Patriots love them more than their detractors hate them. Let's say Lloyd ends up facing Maurice Jones-Drew from Jacksonville—small market, not a lot of fans. But nationally? I don't know what the outcome would be. I learn a lot about football fans from this." While EA Sports made its peace with candidates changing teams there are other controversies that could warp the tournament or give the label an unexpectedly undesirable candidate. Brandon Marshall, a candidate representing Miami (since traded to Chicago) is a accused of punching a woman in the face outside a nightclub. He hasn't been arrested. After the first week of voting, Marshall was leading then-teammate Reggie Bush. Bush won out. I asked Stevenson if EA Sports has a mechanism to rig the defeat of players who get into that kind of trouble, and if it was used in Marshall's case. Stevenson said the label would act if it a cover candidate developed a serious image problem mid-tournament, but Marshall's defeat was all thanks to the voters. "But, we are EA Sports. We're an E-for-Everyone company, we've got to be comfortable with a guy we're putting on the cover of a game we're selling to 10-year-olds," Stevenson conceded. "If something comes to light, if there are formal allegations or something proven out, we need to deal with it. In Brandon's case, he lost, so we haven't had to do that yet." And then there's the potential for mischief when the keys are given to the kids. Example: The Raiders' pairing of two special teams players, kicker Sebastian Janikowski and punter Shane Lechler. No doubt many fans would chortle at such a proud video gaming franchise being forced to put a punter on its cover, and would cast a joke or protest vote for him. As it is, Janikowski will face Jones-Drew, one of the league's most-liked players and a reliable fantasy football performer who has ingratiated himself to many fans outside of Jacksonville. I asked Stevenson if he held his breath on the Lechler-Janikowski pairing, worried that he'd get the punter. "Not at all," he said. "When we got to the Raiders, there are two 99-rated players on that roster: Janikowski and Lechler. And they did have special seasons." But the winner of the first tournament, ostensibly meant to pick a fan favorite, did not have a fan favorite year. And not in the typical Madden cover curse manner, either. Yes, Peyton Hillis was injured, but he also alienated the very loyal Cleveland fan base that got out the vote and put him—the only player from a losing team so far—on the Madden cover. Why put something this critical to a marketing operation—especially for such an image-conscious product representing an image-conscious sport and league—up to the whim of the public, and the chance it all may go sour? 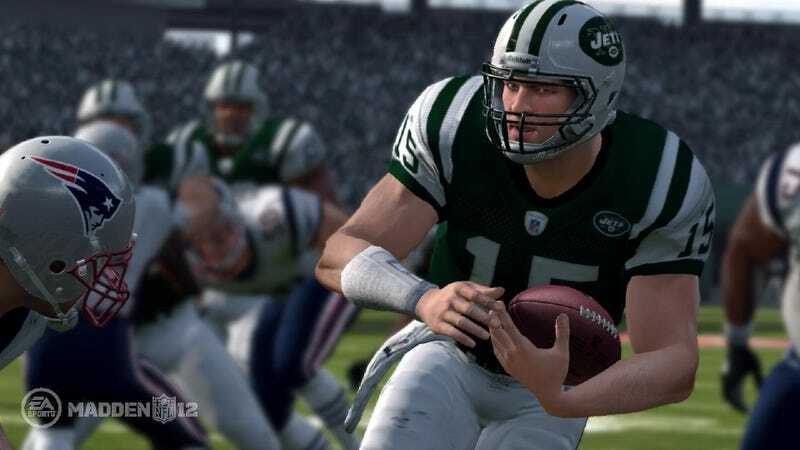 "When we look back, five years from now, even at Madden NFL 12, it's going to be a snapshot of where the NFL universe was at that time, with fantasy football in it prime and a player who won a lot of leagues for a lot of people. And [Hillis] was an underdog winner for a hard-luck city—they had [Michael] Jordan shooting over [Craig Ehlo], and they lost LeBron—but they could control this. And they did. "Things happen and everybody is human," Stevenson said. "It doesn't matter if we were the only ones sitting in that room, and we put Player X on the cover, we can't predict what will happen with him, either. All things being equal, we're letting the fans who made this game great make a great cover for us."